OK this is going to hurt. 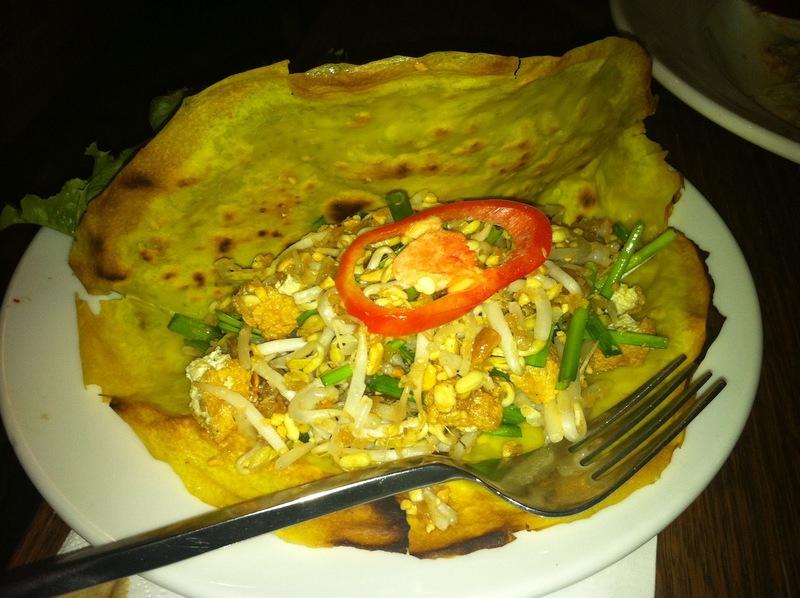 Sydney has far better Thai food than Melbourne. I can’t believe I admitted that, now I feel dirty. Being a parochial Melbournian (and ex Queenslander) I find it very difficult to compliment Sydney at the best of times but this one is just plain unavoidable. I was in Sydney for a couple of days for a work conference and decided that I really needed to find out for myself whether all this talk of Sydney having superior Thai food to Melbourne was actually true. I had heard about the infamous Thai Town district in Haymarket and seeing as I was staying in the city that seemed a good place to start. 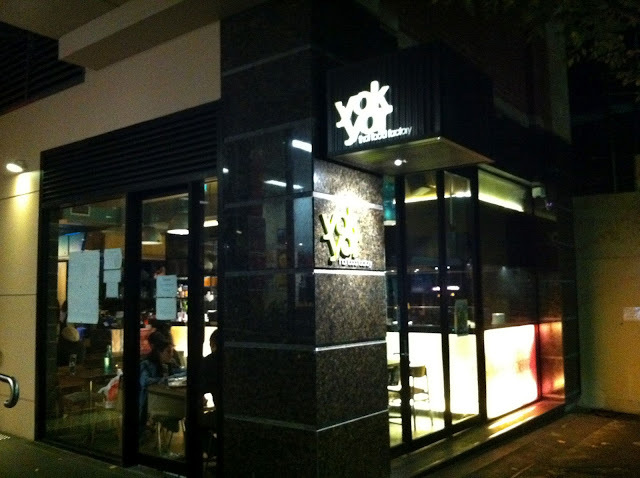 After consulting a few blogs and checking out the Sydney Thai magazine I decided my first visit would be Yok Yor in Haymarket. I was lucky enough to be joined by an old friend Kate and even luckier that she let me choose the dishes that evening. I’m not sure what the deal is with the Yok Yor kitchen staff wearing hard hats but that certainly wasn’t of much interest to me, I was attracted by the great selection of interesting dishes on the menu. This was to be the first of many experiences over the next few days where I was both surprised and delighted to see a menu with numerous dishes that I’d previously only ever seen offered in Thailand. 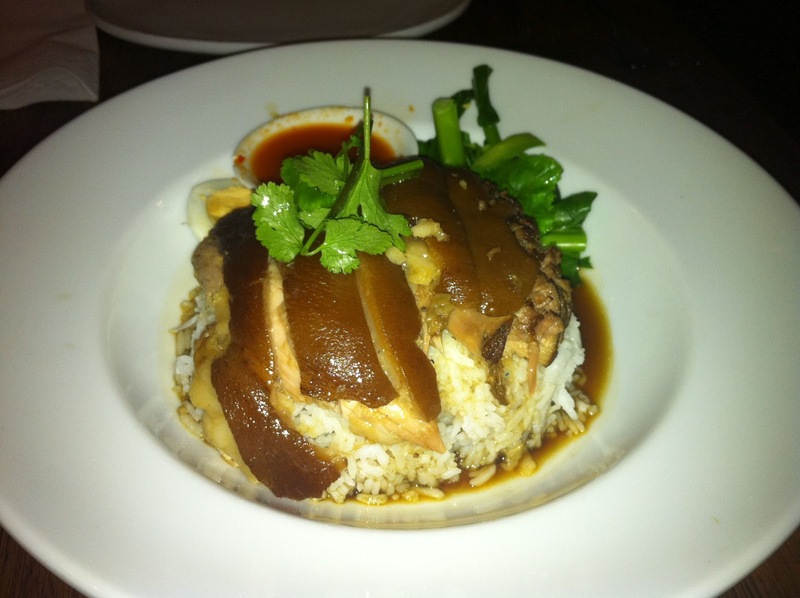 Khao Ka Moo is a very decadent dish of fatty stewed pork leg on rice served in a sweet gravy and accompanied by a lovely chilli and vinegar relish. The fattiest part of the pork leg is used, the skin is left on and no attempt is made to render away any fat. Definitely not one for those who cut the rind off their bacon (Tina) that’s for sure! This was great, super rich and super flavoursome. The squishy fatty pork is a textural sensation although it does require some self counselling to push that feeling of guilt deep down inside where it can’t be seen or heard. I was always going to eat Gai Yang (Thai grilled chicken) at least once while I was in Sydney and Yok Yor's Peek Gai Yang at $3 each seemed a pretty good option. I'm pretty sure Peek means wing in Thai. 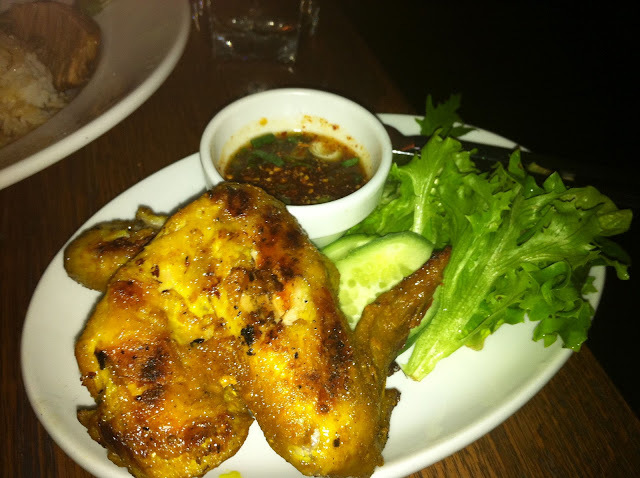 These wings were lightly charred and and gorgeously tender as you’d expect but the highlight for me was the Nahm Jim Jeaw dipping sauce which hit all the right marks on the sweet, salty, spicy and sour scale while also providing some texture via the ground toasted glutinous rice. 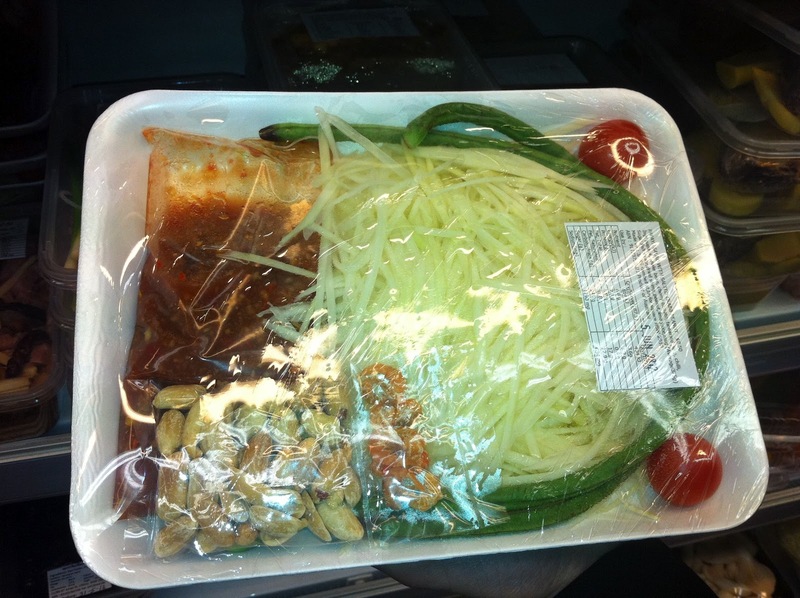 The next dish was a completely new one for me that I’d never seen before, even in Thailand. It actually filled in the blanks of a conversation I had with my Thai teacher a while ago when I was unsuccessfully trying to explain/pronounce Kanom Buang. This is an old post of the Kanom Buang I enjoyed in Bangkok for those not familiar with this delicious treat. I was a bit lost when she told me that Kanom Buang dish was influenced by Vietnamese dish Banh Xeo as I really couldn’t see the link, especially as Kanom Buang is a dessert. So enter Kanom Buang Yourn and mystery solved. Described on the menu as Thai style crispy crepe filled with shredded prawn and coconut accompanied with cucumber and red onion relish it's impossible not to see the link with Banh Xeo. Simply described as a light refreshing Thai salad served in a crispy crepe with a killer dressing, this dish was my favourite of the night. The last dish was also a bit of a surprise as I thought I had ordered Yum Pla Dook Foo (crispy fried catfish salad) but apparently I was mistaken and what arrived was certainly nothing like I was expecting. 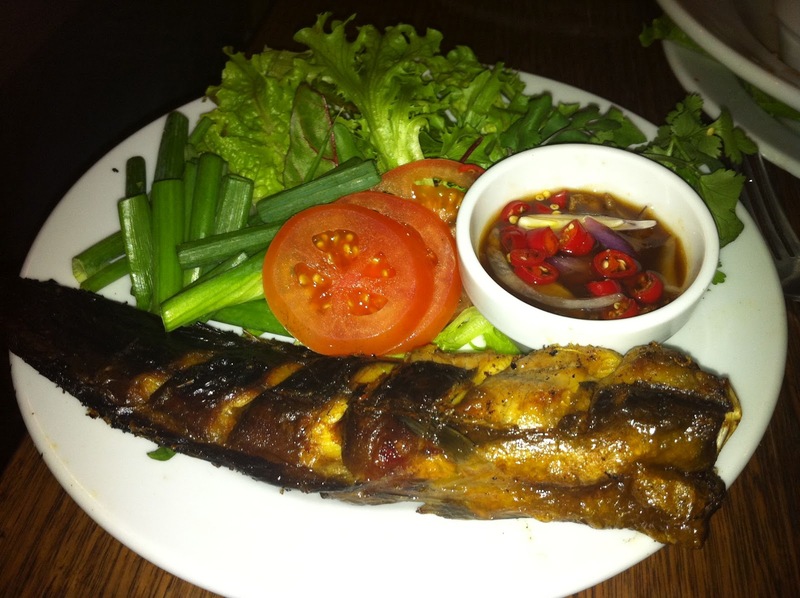 Pla Dook Yang Nahm Pla Warn is grilled catfish served with a sweet tangy tamarind sauce. I had seen this being grilled in food stalls all over Bangkok but had never summoned the courage to try one. There was no point wimping out now so I attacked this headless little catfish with my fork and spoon and gave it a good dousing in the dipping sauce. Catfish is a much maligned little fellow however when cooked properly it's actually very good. I did struggle a little with all the bones but I suspect there is a bit of an art to eating these little guys while avoiding having to awkwardly negotiate lots of little bones. After dinner we took a bit of a wander around Thai Town mostly so I could determine what and where I would be eating for the next few days but also to check out the numerous Thai grocers nearby. If I wasn’t jealous enough about the quality and authenticity of the Thai restaurants I was extremely envious about how easily the Sydney CBD workers are able to access such a great range of Thai ingredients including fresh snake beans, green papayas, monkey bananas and even betel leaves to list just a few. The range of ready made meals and desserts was also very impressive and I was particularly taken with the DIY Som Tam kit that even included a little bag of dressing.